So….you’ve decided to cook up a juicy, tender, flavorful Filet Mignon. Obviously, the first thing you need to do make your way to your favorite purveyor of this most tender of steaks, and plunk down what is likely to be a fair amount of your hard-earned money. Filet Mignon is not a cheap cut. Most places will charge at least $15/lbs…and I’ve often seen north of $30/lbs for the highest quality cuts. So, if you’re going to lay out that much cash, you should make sure you know how to buy the best filet mignon you can afford. Go ahead and take a look at my tips for buying filet mignon. It should be obvious that a shabby, dirty, dingy store…is going to have crappy steak. That doesn’t mean you’ve got to go to a gourmet shop, but any place I buy meat, fish and produce has be clean and well kept. If the seller isn’t keeping his shop at high standards, there’s no reason to expect the filet to be high quality. Almost all the filet sold in super markets falls into the category of USDA Choice. A “Choice” cut is very good, but it’s one step below USDA Prime. Only about 2% of the steaks butchered in the US, fall into the Prime bucket, so it’s fairly rare, and you’re like to only find it at specialty shops. Prime Filet Mignon, has more marbling (fat) than choice, which gives the meat more flavor and makes it even more tender. If you can find a Prime Cut of filet, chances are it’s better than any Choice you’ll find, but you’ll also pay quite a bit more for it. Don’t buy any filets that aren’t marked at least Choice. A bit of aging is actually very good for a steak. As time passes, the steaks become more tender and flavorful (as water evaporates). However, a true “aging” process is done under very sanitized conditions to ensure the meat doesn’t spoil…and for a true aged Filet Mignon, just like a Prime rating, you’re going to have to pay quite a bit. What you should be most concerned with is getting an “old” steak…one that is getting close to spoiling. Look for graying spots or other discoloration…signs the steak is reaching its maximum shelf life. You can also obviously look at the packaging, and the sell by date…the more time you have the better. 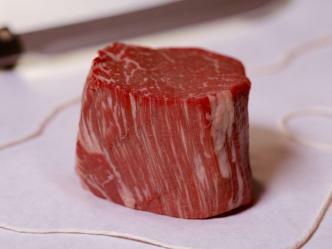 The filet you buy should be a uniform dark pink/red, with streaks of fat running through it. Filet Mignon steaks are cut from the Beef Tenderloin, which is a long muscle, that looks a bit like a fat baseball bat. However, the tenderloin is actually a couple muscles held together with come connective tissue – particularly on one end. Filet Mignon cut from the end of the tenderloin, sometimes called the Tail, is actually two muscles just barely held together. During prep time, and cooking, these two muscles will likely split apart, which makes it harder to cook the filet to the right doneness…and frankly doesn’t look as appealing. Filet Mignon, “cut from the center” is from the primary muscle, one solid piece of meat that will hold together much better when cooked. What Size Filet do You Want? Personally, I like to make sure that my Filet Mignon has a hard sear on the outside and barely cooked center. To help make sure it comes out that way, I like filets that are as thick as they are wide – kinda like a giant meatball. Getting a thick steak like that, makes it easier to cook it to rare or medium rare. Now, if you like your filet well-done (you’re likely a communist! ), you’d want to stay away from thicker cuts. By the time you got the center cooked through, the outside would be a burnt crisp. Instead, opt for a thinner cuts, that will sear on the outside, and quickly cook through. After buying your $100 filet, the most useful thing you should master is the "sous vide" technique of cooking it to perfection every time. No more overcooked steaks.